Watauga County is the second North Carolina County to be studied for potential and known landslide hazards. North Carolina Geological Survey staff in Swannanoa (Asheville Regional Office) are heading up this multi-year effort. Watauga County landslide hazard maps are complete and available from this web page as Adobe PDF documents. 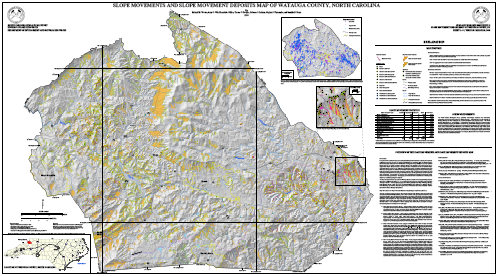 Slope Movements and Slope Movement Deposits Map of Watauga County, North Carolina [GHMS-3, Sheet 1]. Stability Index Map of Watauga County, North Carolina [GHMS-3, Sheet 2]. 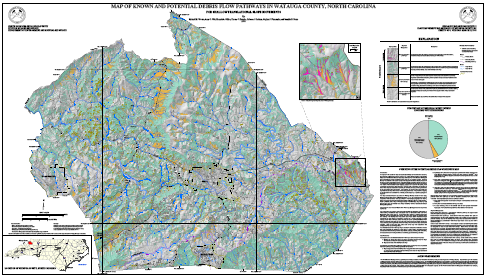 Map of Known and Potential Debris Flow Pathways in Watauga County, North Carolina [GHMS-3, Sheet 3]. Map Showing a Zone of Potential Rock Slope Instability in Watauga County, North Carolina (with Generalized Bedrock Geologic Compilation) [GHMS-3, Sheet 4]. 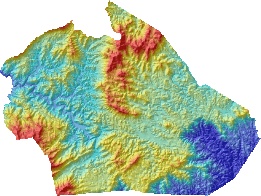 Watauga County Digital Elevation Model used in the mapping. File size of GHMS-3, Sheet 1 is 16 MB. This Map shows where landslides are known to have occurred in Watauga County. This Stability Index Map shows where landslides might start in the future. This Debris Flow Pathways Map shows where landslides have gone in the past, and where they might go in the future. 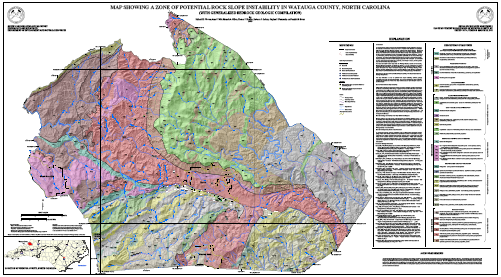 This map is a generalized geologic map of Watauga County showing a zone of potential rock slope instability.